I’ve resisted choosing a Caravaggio for my POTM for some time, but after going to Sicily especially to look at their three Caravaggio paintings, I had to write about one of them. It is always hard to read a Caravaggio painting with fresh eyes, disregarding the context of his infamous life. 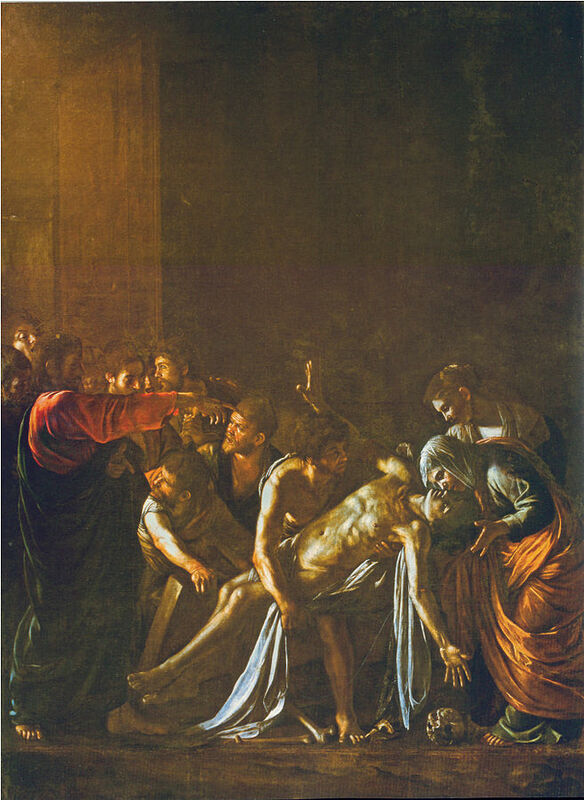 Painted during a tumultuous time in the artist’s life (exiled from Rome and on the run from the Knights of Malta) and one year before his untimely death, The Raising of Lazarus (1609) has an undeniable darkness and immediacy that reflect his circumstances. Walking into the room at the Museo Regionale in Messina – which houses this work and The Adoration of the Shepherds of the same year – I was struck by the heavy pressure of the work, but simultaneously surprised by its luminosity; the colour and detail that is so often washed out or obscured in books or images online. I must have spent at least ten minutes looking at it, letting my eyes examine every inch of the canvas and fully absorbing myself into the scene. The story is from the gospel of St John, in which Jesus Christ resurrects a man from his grave. Considering the holiness of the occasion, it is a strikingly ordinary scene. There is no real sign that what is happening is miraculous; no swarms of cherubim, no Baroque fanfare of trumpets or cloud-enthroned saints descending from the sky to bear witness. As in The Calling of St Matthew (1599/1600), Jesus emerges from the darkness, arm raised with the same vivid blood red sleeve, commanding Lazarus from his tomb. According to the gospel, Jesus is informed that Mary and Martha are seeking his help for their dying brother, but rather than come to the rescue Jesus lets Lazarus die so that he may perform the miracle in God’s name. Four days after the man’s death, Jesus arrives at his grave, which here appears to be in an urban back-alley. Surrounded by a crowd he proclaims “Lazarus, come out!”, and the body of Lazarus rises, freed from his shroud and eternal sleep. His body is posed in such a way as to remind us of Christ’s crucifixion and resurrection. His legs are stiff but his arms reach out from rigor mortis, life is re-coursing through him like an electric shock. You can almost hear him draw breath again. It is reminiscent of Michelangelo‘s image of the Creation of Adam (c.1512) in the Sistine Chapel, in the way a simple gesture, a point of the finger from a divine being, can harness the power of life. The people bustling around the drama all react individually. Some are confused, others are shocked in disbelief, some silent and others vocal. They are ordinary people (not idealised) like those that any one in Italy at the time would perhaps recognise. And this is the genius of Caravaggio; making scenes feel real through depicting a story in a real setting using real people, and therefore making the message more powerful.